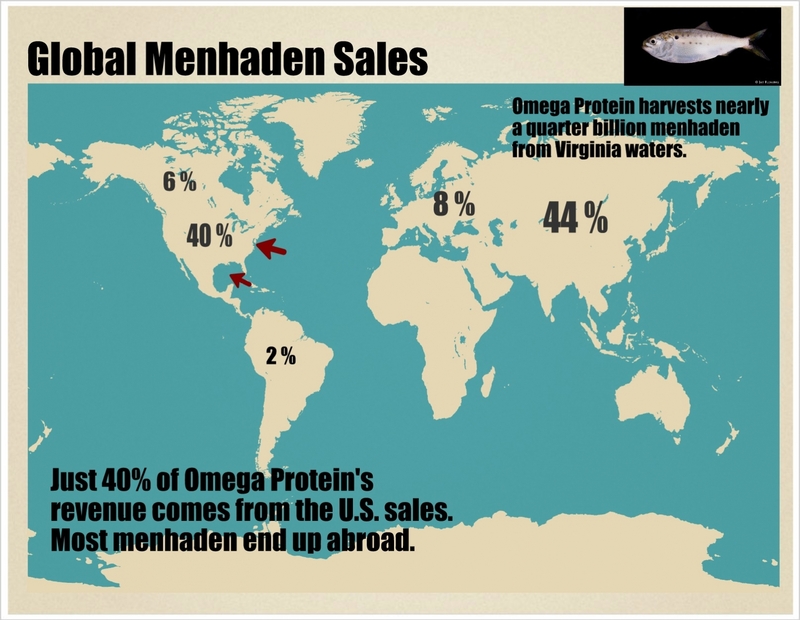 Omega Protein was hardly the first to recognize menhaden’s value. The etymology of menhaden indicates its longstanding place in food production. Its name derives from the Narragansett word munnawhatteaûg, which literally means “that which enriches the land.” Archeological research on Cape Cod shows that Native Americans there buried fish believed to be menhaden in their cornfields (Mrozowski 1994:47–62). William Bradford and Edward Winslow’s firsthand account from 1622 of the Pilgrims at Plymouth, Massachusetts, describes the colonists manuring their farm plots with fish “according to the manner of the Indians” (Bradford and Winslow 1622). As the menhaden catch grew, small factories and fishing fleets went out of business. By 2006, only one company was left standing. Omega Protein, headquartered in Texas, catches between a quarter and a half-billion pounds of menhaden each year from the Atlantic, and nearly double that amount from the Gulf of Mexico. Because Omega Protein dominates the industry, its annual investor reports make it possible to trace menhaden through the global food chain from its reduction facility in Reedville, Virginia, and handful of factories in Louisiana and Mississippi. Figure 1. Global menhaden sales. Consistent with Native American usage, menhaden micronutrients—principally nitrogen, phosphorus, and potassium—are used to make fertilizers. In the United States, menhaden-based fertilizers are used to grow onions in Texas, blueberries in Georgia, and roses in Tennessee, among other crops. A small portion of the fats are used to make human nutritional supplements, namely fish oil pills containing omega-3 fatty acids, which have been associated with a reduction in some risk factors for heart disease. Omega-3s are found naturally in some green vegetables and nuts. They’re also in algae, which menhaden consume in large quantities. As a result, menhaden and the fish species that rely on menhaden for food are full of omega-3s. In 2004, the US Food and Drug Administration allowed manufacturers to make claims on food packages linking consumption of foods containing omega-3s to a reduced risk of heart disease. Whether or not taking omega-3 fish oil pills has the same benefits as eating foods that contain omega-3s remains a matter of debate (Allport 2006; Kris-Etherton et al. 2002; Rizos et al. 2012). Nonetheless, sales of fish oil pills grew from $100 million in 2001 to $1.1 billion in 2011 (Frost & Sullivan Research Service 2008; Herper 2009; Packaged Facts 2011). The market for omega-3 supplements and for foods and beverages fortified with omega-3s was $195 million in 2004. By 2011, it was estimated at $13 billion. For Omega Protein, the real money is in menhaden proteins and fats, which have become ingredients in animal feed for industrial-scale aquaculture, swine, and cattle growing operations in the United States and abroad. The company is well positioned to continue expanding sales of menhaden around the world. While the global supply of both fats and proteins have been flat since 2004, demand has grown considerably. Omega Protein’s revenue per ton has more than tripled since 2000. Total revenues were $236 million in 2012, a 17.8 percent gross margin. Figure 2. 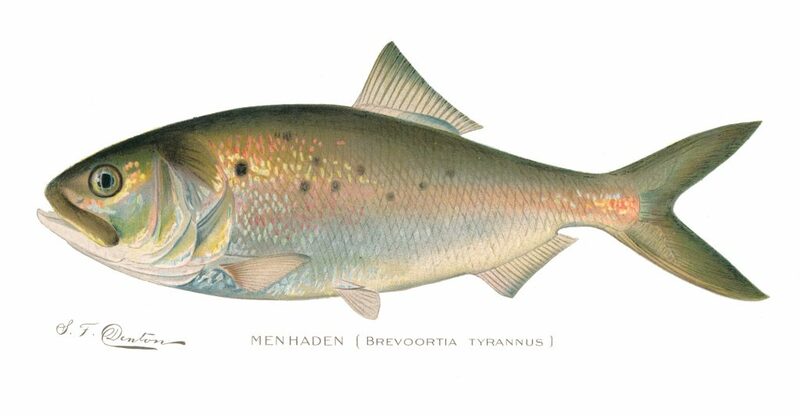 Where do menhaden go? Omega Protein’s “blue chip” customer base for animal feed and human supplements includes Whole Foods, Nestlé Purina, Iams, Land O’Lakes, ADM, Swanson Health Products, Cargill, Del Monte, Science Diet, Smart Balance, and the Vitamin Shoppe. But the companies that buy menhaden meal and oil from Omega Protein are not required to label whether their products contain the fish, making it impossible for consumers to identify whether they are ingesting menhaden. However, given the volume of the fishery and the scale of Omega Protein’s distribution, if you have sautéed farm-raised salmon or rendered supermarket bacon, you have likely eaten animals raised at least in part on menhaden. You may have also fed animals raised on menhaden to your pets, swallowed menhaden in gel capsules recommended by your cardiologist, or sprinkled them on your backyard vegetable garden. “We’ve evolved the company over time to where you can get up in the morning, have an Omega-3 (fish oil) supplement to start your day, you can curb your hunger between meals with a protein shake, and you can sit down at dinner with a piece of salmon, and chances are, one of our products was used to help raise that salmon,” Omega Protein CEO Brett Scholtes said in a recent interview with the Houston Business Journal (Ryan 2013). Why does it matter that this tiny fish is used to fuel the growing global demand for animal protein as global incomes rise and diets change (WHO 2013:5)? Because menhaden are not only valuable to the human food supply, they are also linchpins of the oceanic food chain. Menhaden spawn in the ocean, but most of the fish head to the Chesapeake Bay to grow older in the brackish waters of the nation’s largest estuary. Historically, the Chesapeake Bay supported a huge population of menhaden: legend has it that Captain John Smith saw so many menhaden packed into Chesapeake Bay when he arrived in 1607 that he could catch them with a frying pan. In this nursery environment, menhaden grow and thrive in large schools before migrating up and down the Atlantic coast. These menhaden schools supply vital, nutritious food for dozens of important predators, like striped bass, weakfish, bluefish, spiny dogfish, dolphins, humpback whales, harbor seals, osprey, loons, and more. In 2009, fisheries scientists reported that the Atlantic menhaden population had shrunk to less than 10 percent of its original size. Industry scientists argue that little prey fish like menhaden, sardines, and herring reproduce fast enough to replace those that are removed from the ocean food chain by commercial fishing. But many environmentalists, government and academic scientists, and coastal residents argue that menhaden fishing destabilizes ecosystems, leaving too few menhaden in the water to account for predator demand. Striped bass have long been one of the most voracious predators of menhaden on the East Coast. Today, many striped bass in the Chesapeake Bay are afflicted with mycobacteriosis, a previously rare lesion-causing disease linked to malnutrition. Osprey, another menhaden predator, have not fared much better. In the 1980s, more than 70 percent of the osprey diet was menhaden. By 2006, that number had fallen to 27 percent, and the survival of osprey nestlings in Virginia had fallen to its lowest levels since the 1940s, when the insecticide DDT was introduced to the area, which decimated the osprey young. And in the mid-2000s, researchers began finding that weakfish, an economically important predator fish in the Atlantic Ocean, were dying in high numbers. Without a healthy, plentiful stock of menhaden on which to feed, striped bass were preying on small weakfish and substantially reducing their population. In 2012, a panel of marine experts known as the Lenfest Forage Fish Task Force estimated that the value of leaving forage fish in the ocean as a food source for predators was $11 billion: twice as much as the $5.6 billion generated by removing species like menhaden from the ocean and pressing them into fish meal pellets (Pikitch et al, 2012). After decades of advocacy by environmental organizations, in December 2012, a regulatory agency called the Atlantic States Marine Fisheries Commission implemented the first ever coast-wide regulation of the menhaden fishery. The Commission cut the menhaden harvest by 20 percent from previous levels in an attempt to safeguard the population from further decline. The regulation was implemented during the 2013 fishing season; whether it has affected the menhaden population is a question government scientists are scrambling to answer. Meanwhile, menhaden products remain vital to global production of cheap fish and meat. The industrial food system relies on extracting nutrients from wild animal bodies. We consume menhaden in the form of pork chops, chicken breast, and tilapia. And in doing so, our eating habits lead to the deaths of birds and predator fish that never actually pass our lips. Allport, Susan. 2006. The Queen of Fats: Why Omega-3s Were Removed from the Western Diet and What We Can Do to Replace Them. Berkeley CA: University of California Press. Bradford, William, and Edward Winslow. 1622. A Relation or Journall of the Beginning and Proceedings of the English Plantation Settled at Plimoth in New England, by Certaine English Adventurers Both Merchants and Others. Available at link. Franklin, H. Bruce, 2007. The Most Important Fish in the Sea: Menhaden and America. Washington DC: Island Press. Frost & Sullivan Research Service. 2008. “The U.S. Omega 3 and Omega 6 Markets.” November 13. Available at link. Herper, Mathew. 2009. “One Supplement That Works.” Forbes, August 20. Available at link. Pikitch, Ellen, Dee Boersma, Ian Boyd, David Conover, Phillipe Curry, Tim Essington, Selina Heppell, Ed Houde, Marc Mangel, Daniel Pauly, Éva Plagányi, Keith Sainsbury, and Bob Steneck. 2012. “Little Fish, Big Impact: Managing a Crucial Link in Ocean Food Webs.” Lenfest Ocean Program: Washington, DC. Kris-Etherton, Penny M., William S. Harris, and Lawrence J. Appel. 2002. “Fish Consumption, Fish Oil, Omega-3 Fatty Acids, and Cardiovascular Disease.” Circulation 106:2747–57. Mrozowski, Stephen A. “The Discovery of a Native American Cornfield on Cape Cod.” Archaeology of Eastern North America (1994): 47-62. Packaged Facts. 2011. “Omega-3: Global Product Trends and Opportunities.” September 1. Available at link. Rizos, E. C., E. E. Ntzani, E. Bika, M. S. Kostapanos, and M. S. Elisaf. 2012. “Association Between Omega-3 Fatty Acid Supplementation and Risk of Major Cardiovascular Disease Events: A Systematic Review and Meta-analysis.” Journal of the American Medical Association 308(10):1024–33. Ryan, Molly. 2013. “Omega Protein’s CEO wants to help make you healthier.” Houston Business Journal, September 27. Available at link. World Health Organization. 2013. “Global and Regional Food Consumption Patterns and Trends: Availability and Changes in Consumption of Animal Products.” Available at link.